Steve Jobs has a reputation for being an outstanding presenter. This slideshow from Carmine Gallo is inspired from the book of the same name which I have seen a lot of references to lately (RSS readers may need to open post to view). What tips do you have about presenting? I love comic books and they have played a huge part in helping me understand how to communicate visually. This Saturday is Free Comic Book Day where you can explore this medium for free. The comic book art form has evolved past superheros and many different kinds of stories will be available for you this weekend. 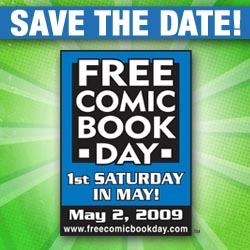 Visit http://www.freecomicbookday.com/ to find your local store and to see what titles will be offered. An Introduction to Visual Thinking slideshare by Ryan Coleman offers great tips for communicating visually (RSS Readers will need to open post to view presentation). It shows how to identify and label nodes in your drawing to make simple pictures more meaningful. It also shows another visual way of explaining things using just shapes and words.